Tupelo Community Theatre will present the Mississippi premier of The Glitter Girls by Mark Dunn January 24, 25, and 26 at 7:30 p.m. and s matinee on the 26that 2 p.m at the Lyric Theatre. This southern comedy takes us through a specially called meeting of a north Georgia social club called “The Glitter Girls.” The club’s richest member, Trudy Tromaine (who is at death’s door) convenes the meeting to express her wishes to bequeath some of her millions to one lucky “Sister of the Gleam and Sparkle.” Tickets are $20 for adults and $10 for students and younger and may be purchase beginning at Noon on January 14th by calling 844-1935. Tupelo Community Theatre will hold auditions for Rupert Holmes’ “A Time to Kill” on Sunday, January 6, 2019, at 5:00 PM and Monday, January 7, 2019, at 6:00 PM in the rehearsal hall of the Lyric Theatre at 201 N Broadway in Downtown Tupelo. Based on John Grisham’s book by the same name, the show is set in 1980s Mississippi and deals with issues of racial, economic, and social disparities of the time. The cast calls for 3 to 4 females, ages 25 and above and 14 to 17 males, ages 25 and above. This show affords an excellent opportunity to “get your feet wet” in community theatre with the numerous roles. The show does include some harsh adult language and adult situations. No advanced preparation is required. Production dates are March 7, 8, and 9 with rehearsals beginning on January 27. For more information, call 662-844-1935 or email the director, Bobby Geno, at robertgeno@comcast.net. TCT will present educational day performances of The Lion, the Witch and the Wardrobe, dramatized by Joseph Robinette from the story by C.S. Lewis, on Monday, December 3rd at 9 a.m. 11 a.m. and 1 p.m. Due to time restrictions the cast will present excerpts from the full length show. This new dramatization of C.S. Lewis’ classic, set in the land of Narnia, faithfully recreates the magic and mystery of Aslan, the great lion, his struggle with the White Witch, and the adventures of four children who inadvertently wander from an old wardrobe into the exciting, never-to-be-forgotten Narnia. The intense action features chases, duels and escapes as the witch is determined to keep Narnia in her possession and to end the reign of Aslan. This story of love, faith, courage and giving, with its triumph of good over evil, is a true celebration of life. Tickets are $4 each for all schools attending the day performance and usually sell out quickly . Evening performances of the show will December 6-8 at 7:30 p.m. and December 8th at 2 p.m. Tickets are $20 for adults and $10 for students and younger. 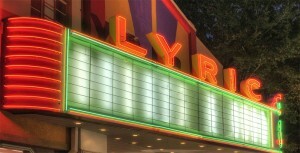 Tickets for the evening performances will go on sale November 26th. For more information or to reserve seats for call 662-844-1935 beginning Monday October 15th at Noon. TCT Off Broadway will present a youth production of Broadway Beat on April 12 and 13 at 7:30 p.m. and Aril 14 at 2 p.m. at 213 East Franklin Street. The show includes musical highlights from over a century of song and dance including Hairspray, The Music Man, The King and I, Wicked, Rent and Grease, and a medley of favorites from George M. Cohan! Tickets are $10 for adults and $5 for students and younger and may be reserved by calling the TCT office at 844-1935. 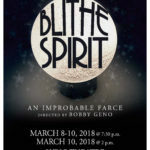 Tupelo Community Theatre will present Blithe Spirit by Noel Coward on March 8, 9 and 10 at 7:30 p.m. and at 2 p.m. on the 10th at the Lyric Theatre in Downtown Tupelo. This smash comedy hit offers up fussy, cantankerous novelist Charles Condomine, remarried but haunted (literally) by the ghost of his late first wife. A visiting “happy medium” Madame Arcati calls up the late, clever and insistent Elvira. As worldly and other worldly personalities clash, Charles’ current wife, Ruth, also dies and passes over to join Elvira. The two “blithe spirits” then lovingly haunt Charles into perpetuity. Tickets are $20 for adults and $10 for students and younger and go on sale to the public at Noon on February 26th. For more information or to purchase tickets call the TCT box office at 662-844-1935.